Twenty years ago I began an extraordinary journey with Franklin and Eleanor Roosevelt. Fresh out of college and looking to gain experience working in a museum, I applied to the Franklin D. Roosevelt Presidential Library and Museum. As luck would have it, the Library was in the process of expanding its public programs, and I was hired to assist the Pubic Affairs Specialist. Several years into my time at the Library, I was offered the opportunity to work in the Museum Department – an offer I leapt at – and thus began my on-the-job education in the world of museum work. In my transition from public affairs assistant to Museum Collections Manager, I have had the chance to examine Franklin and Eleanor Roosevelt through a variety of resources: documents, photos, films, books, etc. Add to these sources the objects in the Museum collection, and the Roosevelts truly become dimensional figures. Like the museum collections in all the Presidential Libraries, our collection of over 34,000 objects is wonderfully varied. It ranges from personal items collected and used by Franklin and Eleanor Roosevelt to objects associated with their public lives and the eras in which they lived – and everything in-between. As the Museum Collections Manager I have the day-to-day responsibility of managing this rich collection of artifacts. This entails the accessioning, cataloging, and tracking of the objects, insuring their safe storage, conducting preservation work on items, and arranging for outside conservation work when necessary. All this is made especially challenging as the Library has been undergoing a multi-year major renovation project. 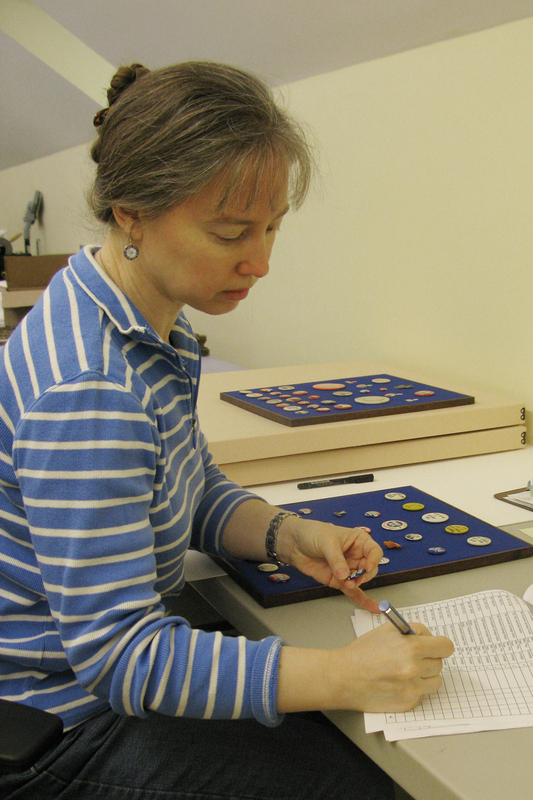 My duties also extend to researching objects, coordinating the loan of objects to institutions around the world, working with the Director and Supervisory Museum Curator on the acquisition of new objects, assisting with exhibit development, and – perhaps one of the most rewarding tasks – answering research queries. All facilitated by the camaraderie, cohesion, and support of a fantastic Library and Museum staff. As the FDR Library and Museum moves into the final year of its renovation, I am looking forward to the beginning of an exciting new era for the Library (I may even get a little giddy over the new storage and processing facilities we will be gaining for the Museum collection!). An era in which we will bring increased public awareness of our Museum collection through dynamic new exhibits, web-based programs, and the continuation of loans to outside institutions. Once again, a self-indulgent column by and about an FDR Library staff member. I do not understand how you can have wanted a job at the FDR Library — where its very reason for being is to inform people about FDR’s magnificent presidential legacy — and end up writing about yourselves. I truly do NOT care about the biographies of FDR Library staffers. Furthermore, you are accepting salaries for doing jobs that you are not doing. A few days ago, we were treated to a photograph of a wooden floor ! Franklin Delano Roosevelt was a great and courageous president, yet all you can come up with in the way of information to post are more photos of a building and more biographies of FDR Library staffers. A neutral person will find more positive commentary about the failed Richard Nixon at Nixon’s presidential library than one will find about FDR at the FDR Presidential Library. I think you should all seek employment elsewhere and the Library should advertise for employees who actually WANT to tell the world about President Franklin Delano Roosevelt. I don’t understand this comment and see no reason for its nasty tone. I doubt that everything posted on NARA websites is personally directed at “Chris”. Many on-line users like to know who is managing our public resources and contributing to our body of accessible information. Almost all information-disseminating outlets such as newspapers, electronic media, colleges, businesses, and like organizations post mini-biographies of personnel on its web pages. The staff at the FDR Library are the very people who tend to the memory and personal property of FDR and make it available to the public and scholars. Since “Chris” admires FDR, you might expect that he would thank the staff for its efforts. I live in the Hudson Valley and have visited FDR’s site often. It is being tended to very well. I think FDR would approve. The photos, including that of a floor, show the extent of the renovations now underway. New York City and the Hudson Valley attract millions of visitors annually and those planning trips to the Valley might want to know what’s happening at the Library for trip planning purposes. They may not be happy with the temporary inconvenience, but, if they cherish FDR’s memory or are interested in him from personal or historic perspectives, they’ll be glad that it’s being preserved and modernized. I believe all, or at least most, of the presidential libraries are managed by NARA. The libraries stretch from coast to coast and it’s probable that most of NARA staff never actually meet. I think that access to a biography of someone to whom you speak might personalize communications and facilitate the exchange of good ideas and the avoidance of bad ideas. This, “Chris”, is good for all concerned. Lastly, I don’t believe the posting of mini-bios in any way detracts from available information about FDR. I don’t think that access to his first inaugural address was removed to make room. If you don’t care about staff bios, DON’T READ THEM!